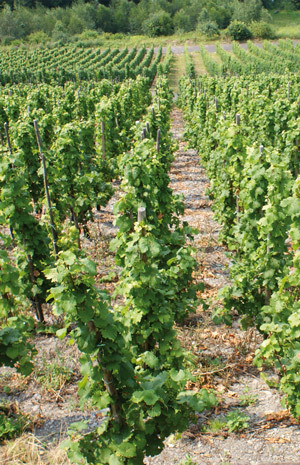 The Mülheimer Sonnenlay is the largest single Richter vineyard and the source of the world-renowned “Zeppelin” Riesling. The vineyard sits on the west-southwestern side of a slate stone hill south of Mülheim, a dry riverbed formed during the last ice age 250,000 years ago. The name of the vineyard– Sonne (sunshine) and lay (slate stone) –perfectly describes the characteristics of the site. This often extremely steep vineyard has a loose slate stone soil structure that is enriched by pebbles, loam and sand deposited by the ancient river. This kind of soil creates wines that combine typical slate stone mineral character with animated and elegant fruitiness. 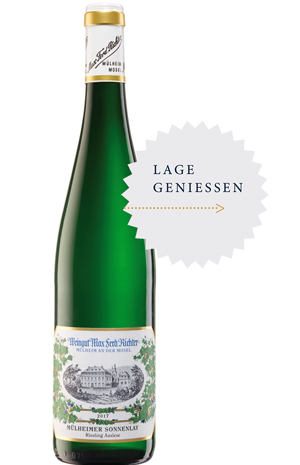 Grapes from the hillside are also used to produce Richter’s single vineyard, singlevintage sparkling brut wine. Wines from the Mülheimer Sonnenlay were served on the luxurious Zeppelin airships -including the Hindenburg – in the 1920s and 30s. Local growers, proud of this distinction, commissioned Bauhaus artist Hans Schlösser to design a label for the wine incorporating the iconic Zeppelin airship. The label is still featured today. 8 a.m. to 12 p.m and 14 p.m. to 17 p.m.
saturdays from 9a.m. to 1 p.m.
As a visitor of this website I assure that I'm following the laws and guidelines of my home country by having the legal age to consume alcohol.